A molecule that possesses chirality is said to be nonsuperimposable. Hey guys! In this new video, we're going to take a look at a new concept called chirality. We’re going to say a molecule is chiral when it possesses a carbon that has four unique groups attached to it. We're going to say this molecule is said to be non-superimposable. That means that you cannot slide it over one another and then be the same. What do I mean by that? Think of your hands. Your hands are chiral. Let's say I have this hand here and I have my other hand, let me put down my pen. Here’s my other hand. When we say things are non-superimposable, that means I cannot slide them over each other and they’d be the same. Right now, my hands are non-superimposable. I can't slide this hand over this hand and they overlap perfectly. If I did this, of course they’d overlap better but that's still not the same thing. When we say overlap, that means that the same faces are overlapping each other. Here, basically my palm turned this way towards me and my other palm turned this way towards you. They have to both be pointing the same direction and overlap perfectly. What's a good example of things that are not chiral? If we had two sheets of computer paper, blank paper, they would be able to overlap each other perfectly. You have a stack of computer paper. They can overlap on top of each other perfectly. We would say that those sheets of paper are not chiral because they can slide on top of each other. You're going to go into more detail in terms of this when you get to Organic. Here you just need to understand the fundamentals. It's basically a carbon that is connected to four different groups. Here is a great example of a chiral carbon. This carbon here is chiral because why? It's connected to four different things. It's connected to a Br, an OH, a H, and a cCH3. You literally count each one of these as a group connected to it. 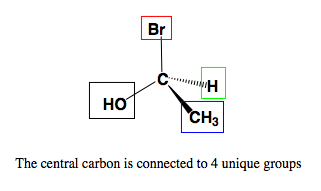 This CH3 cannot this carbon because it's not connected to four different things. We see that it has three hydrogens on it. Already, it can't have four different groups on it because three of the hydrogens are all the same. Here, we're going to say the mirror image of any chiral molecules is called an enantiomer. Basically, we can say that this is my chiral molecule A. We're going to say that enantiomers, two things are enantiomers, mirror images of each other, they have the same connections. They both have the same carbon. They are connected to those same four different groups. Both are connected to Br. Both are connected to OH. Both are connected to H. Both are connected to methyls. Enantiomers have basically the same molecular formula, same connections. They’re just a little bit different because they're mirror images. We're going to say compounds that fit this criteria of having the same formula, same connections but slightly different orientations, we refer to them as stereoisomers. Stereochemistry means that we’re showing wedged and dashed bonds. Here if you’re enantiomers, you're not only stereoisomers but you're also optical isomers. We call you optical because remember optical deals with vision. The thing about chiral centers, chiral molecules is that they have a special property that allow them to basically influence the direction that light will bend in terms of passing through water. We’ll see that in the next section on how exactly can a chiral molecule affect the direction that light travels. Knowing this, I want you guys to attempt to do this. Here I give us a question where it says identify the compound that possesses an asymmetric center. An asymmetric center is just a fancy way of saying a chiral center. Only one of these answers is correct. Remember, a chiral center is when you have a carbon connected to four different things. If it's not connected to four different groups, it cannot be chiral. In example D, let me show you example D real quick. Here it’s drawn as a skeletal formula. Remember, in a skeletal formula every end and every edge is a carbon. This is a carbon, this is a carbon, this is a carbon, this is a carbon and this is a carbon. Remember, carbon must make four bonds. This carbon here is making two, so it’s a CH2. This is a CH2. This is a CH2. And this is a CH2. Then this is just simply a C that's making four bonds already, so it has no hydrogens at all. If you guys got a little bit lost there, make sure you go back and take a look at the videos we talked about when it comes to structural formulas. Being able to read skeletal formulas is going to become essential when you guys get to Organic. But for now, take a look at this question. See if you could find out which compound has a carbon connected to four different things. When you come back, we'll take a look and see which one was the best answer. Good luck guys! A chiral compound is a compound where at least one carbon is connected to 4 different groups. Example #1: Identify the compound that possesses an asymmetric center. Example #2: From the previous question draw the mirror image of the chiral molecule. An enantiomer is the mirror image of a chiral compound. 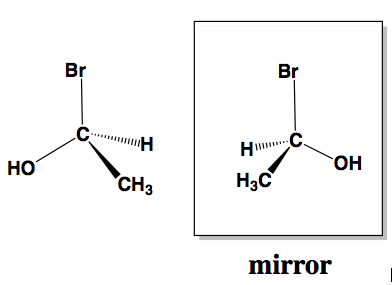 To draw the enantiomer of a compound just image the compound looking in a mirror. Example #3: Draw the mirror images for the following molecule. Practice: Draw the mirror images for the following molecule. How many chiral centers does the following compound possess? Consider the Lewis Structure for aspartic acid (an amino acid found in proteins) for the next four questions (lone pairs are not shown).